If an issue arises with your wood flooring, first call the company that installed it. 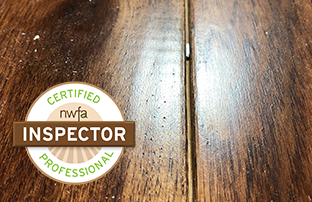 If an agreement cannot be reached, contact an NWFA Certified Professional Inspector who has been trained specifically to conduct wood flooring inspections. When you search for a professional, you will see a category under each company called "NWFA Education Credits". This number reflects certifications achieved and digital badges earned through the NWFA's online learning platform, NWFA University. Click on each company's education credits image to see the individual's earned badges and credentials.